I’ve prepared DIY spring rolls a few times for our dinner or a dinner party. It is quick and easy. There is not much cooking involved since it’s all fresh raw ingredients. It is fun to make, definitely makes you chew and eat slow and you can pick and choose what ingredients you would like to put in your rolls. Don’t expect too much on the first one cause it tends to be a messy one, just like when you make pancakes. Noodles: rice noodles or cellophane glass noodles. Normally I don’t add noodles to my daily spring rolls because it makes the spring rolls more filling and I enjoy eating my spring rolls filled with extra vegetables. Rice papers: Spring roll rice paper wrappers are available in various sizes and thickness. Dipping sauce: I like a tahini sauce with spring rolls. Mix tahini paste, soy sauce, apple cider vinegar, sesame oil and sesame seeds in a small bowl. Add salt and pepper to taste. 1. Dip and rotate a rice paper in the bowl of water. Keep patting until it’s pliable, but not completely soft. If you leave it too long in water, it gets really sticky and hard to roll. 2. Lay wet rice paper on rolling surface. Arrange ingredients at about 1/3 closest to you so that you have a space to roll. 3. 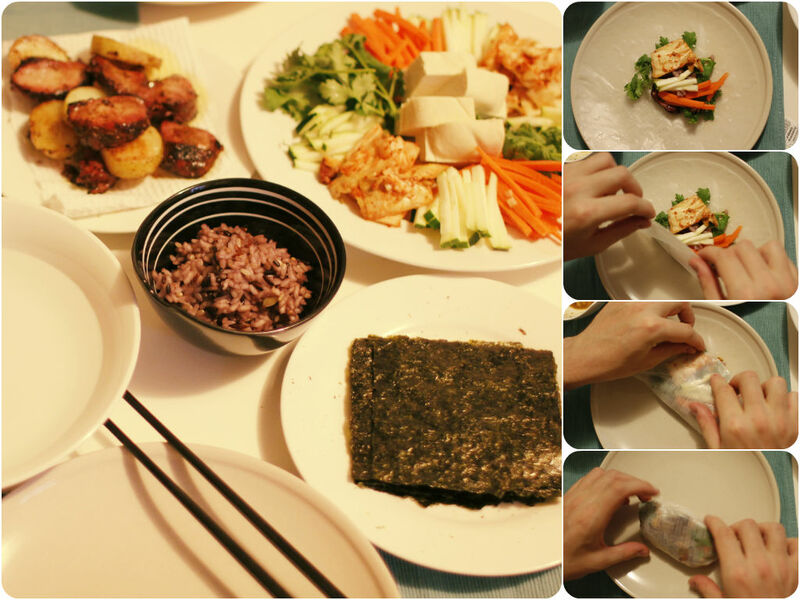 Do not over-stuff your roll, start small then continue to add more fillings that works with your size rice paper. 5. Slowly start to roll away from you and tuck in your filling toward you to keep the roll tight. 6. Eating these fresh as you roll them is best. If you want to take leftovers to work next day, it’s best to wrap each spring roll individually so that they remain fresh and won’t stick.